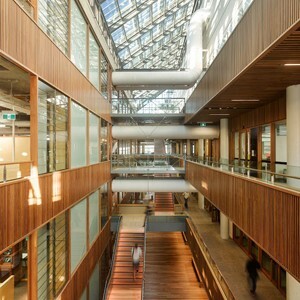 Community-oriented projects dominated the Australian Institute of Architects’ (AIA) 2014 National Architecture Awards, announced Thursday November 6 at the Darwin Convention Centre. A total of 43 awards and commendations were presented to 36 projects across the 12 national categories, with each state represented in the program. The jury, led by Immediate Past President Paul Berkemeier, was particularly impressed with the volume and calibre of public buildings in this year’s crop. “It is encouraging that so many projects embodied best practice with informed clients, effective procurement methods, appropriate funding models and intelligent architecture. This provides us with great optimism for the future of our public spaces – an area that has so often delivered dispiriting outcomes,” said Berkemeier. Taking home the most awards of the night is the UQ Advanced Engineering Building by Richard Kirk Architect HASSELL Joint Venture, which won the Sir Zelman Cowen Award for Public Architecture. The building, which features an open structure to allow a high level of visibility of processes and equipment to visitors and staff, also won the Emil Sodersten Award for Interior Architecture, and an Award for Sustainable Architecture. “The architects have taken an extremely complex program – including teaching spaces, a 500-seat auditorium, laboratories, research facilities and office spaces – and resolved a building that is not only exciting to inhabit, but also a delightful space to occupy,” the jury praised. Another big winner for the night was Breathe Architecture, which received two Named Awards – one in Residential Architecture – Multiple Housing and the other for Sustainability – for its Melbourne project The Commons, which also topped the recent 2014 Sustainability Awards in Sydney. The success of Australian architecture in public spaces is also noted overseas, with the Jorn Utzon Award for International Architecture going to Denton Corker Marshall for the Stonehenge Exhibition + Visitor Centre in the UK.